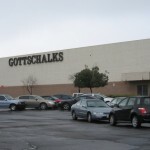 Its anchors are/were Gottschalks (which was, at this point, a few weeks shy of announcing that they were going out of business), Mervyn’s (whose stores had all just shuttered), and Harris, who were acquired several years ago by Gottschalks. 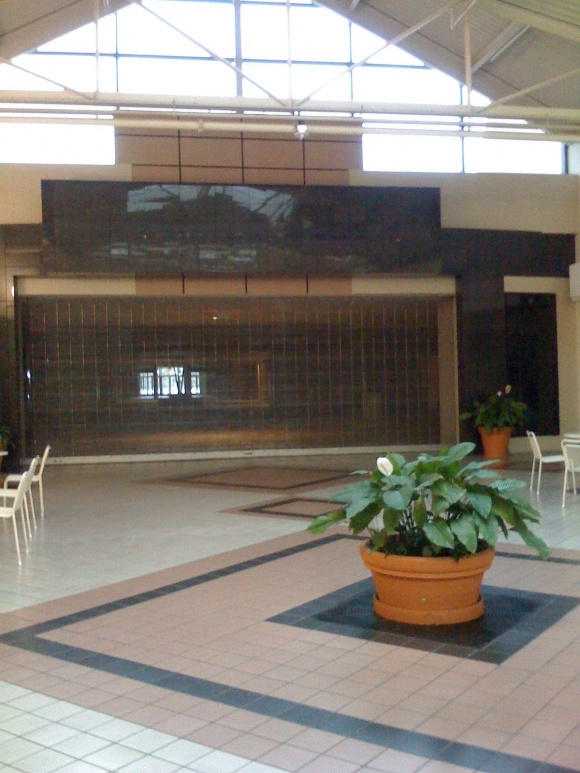 The Harris store at East Hills Mall was shuttered a few years ago. This leaves only a United Artists Theatre as a major anchor tenant in the center. It’s located on the *EAST* side of Bakersfield, which is a higher-crime and lower-income part of town. 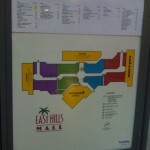 East Hills Mall isn’t a terribly large mall overall. First, just a few notes about Bakersfield itself. Bakersfield is one of the largest cities in California’s central valley, located about 100 miles north of Los Angeles and due west of the Mojave Desert. The region has long been known for its oil production and agriculture, and was one of the prime spots for migrants from the Dust Bowl during the depression. As a result, the region has long held the honor of being California’s most conservative city, due to the influence of Evangelicalism and country music (Buck Owens and Merle Haggard were both from here, and Bakersfield is sometimes referred to as the Nashville of the west). In recent years, however, Bakersfield’s identity has been transforming from its Okie past as new residents–mainly from the Los Angeles area–have come to the area in search of cheaper housing. In addition, a significant number of immigrants from locations as diverse as Mexico, Phillippines, and many countries in the middle east and northern Africa. Bakersfield has even become known as something of a destination for Basque food, which isn’t easy to find just anywhere. Despite the city’s considerable growth, however, it does not remain much of a cultural hotbed, and has significant issues with poverty and crime (as well as a nasty history of racism), and its hot, dusty climate is one of the least favorable in California. With a population of around 330,000 in the city proper and approximately 800,000 in the entire metropolitan area, Bakersfield is the third largest inland metropolitan area in California after Sacramento and Fresno. 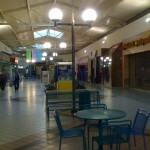 The East Hills Mall is one of only two enclosed malls serving the Bakersfield metropolitan area, and is the far smaller of the two. Unfortunately, there’s also almost nothing about the history of this unloved mall floating around on the internet. 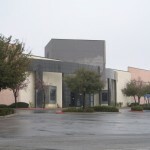 Judging by the architecture, it appears that the 415,000 square foot mall was probably built sometime in the late 1980s. Although we know Harris and Gottschalks were former anchors, I’m not entirely sure if the third anchor was originally a Mervyn’s–something about the architecture of the store tells me it may have been a Target originally (and there is a Target on the outlots of the parcel) but I’m not entirely sure if the timeline matches up for Target to have been in California at the time. I also wouldn’t be shocked if one of these anchors had at one point been a Montgomery Ward or a Robinson’s-May, but I am really guessing here. 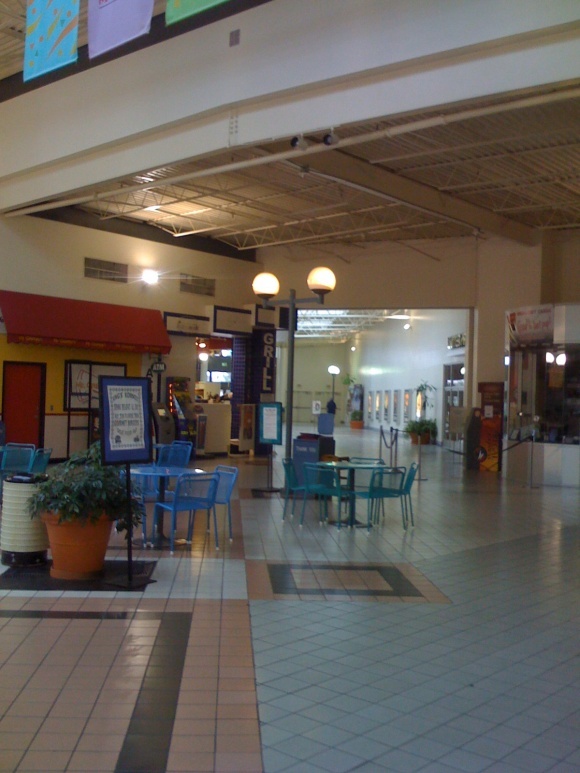 It does appear that the mall’s decline began a long time ago–late ’90s-ish, and was sold in 2003 to a developer who had a plan to modernize and expand the center, especially to cater to the growing suburban area in the city’s northeast hills. Bakersvillians, help us out! When I visited in early January 2009, there was a robust plan to redevelop the center, bringing in new tenants and adding more of an entertainment and dining focus. A year later, the anchorless East Hills Mall filed for bankruptcy, its hopes dashed by the low likelihood of a housing rebound in this somewhat depressed corner of California. 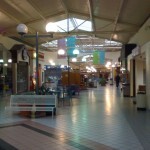 While the mall remains open, it serves as little more than a lobby for the movie theatres and a handful of local merchants who have been able to survive with so little foot traffic. The bankruptcy itself may also force even more dramatic changes–such as the (possibly likely) outcome that the mall will be demolished and completely replaced. Given its condition, that may not be a terrible option. Wow, what incredibly bad anchor choices in retrospect. One thing I’m curious about: was the theater originally a real anchor, because it was almost certainly added on later. I sent you an email Caldor regarding Macy’s and Cincinnati Mall…did you receive it? 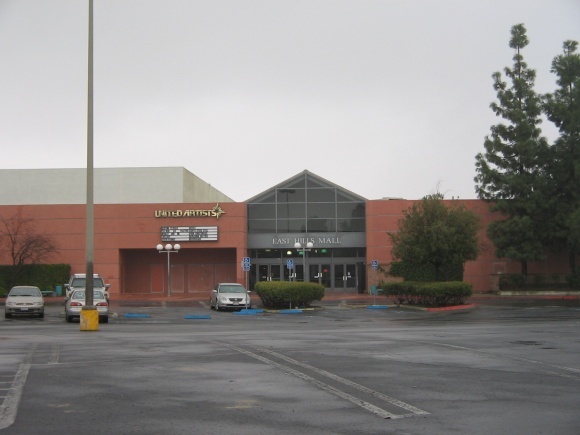 The Theater was not added on later – it opened with the mall and was expanded in the mid 90’s. As to the mall itself, as a kid I remember the first week of it’s opening in the late 80’s and it was so exciting and full of life. It’s quite melancholy thinking of it’s brief but decent heyday. 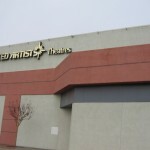 Just today, it is announced the theater will be closing at the end of June 2010, probably the last hurrah of the East Hills Mall. The theater has now reopened as a discount theater. So sad this mall is drowning and dying. 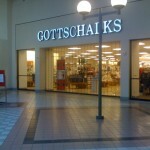 Much of this looks like it was built in the late 80’s, but that Gottschalks looks way older. 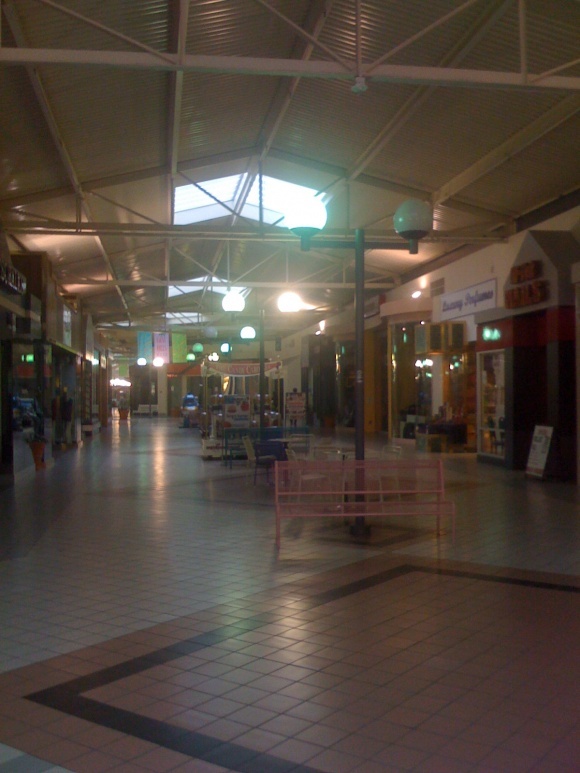 This entire mall looks depressingly cheap and oddly dark. 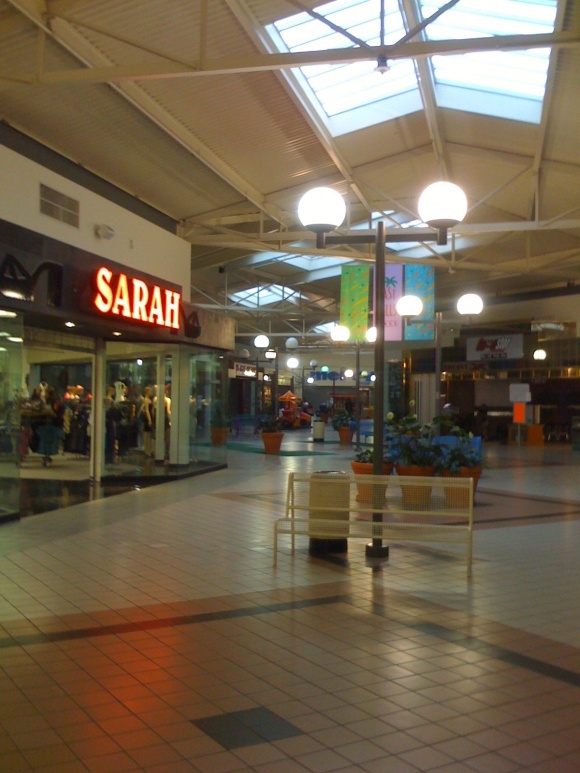 Also if you guys are doing a write-up on Forest Fair Mall aka Cincinnati Mills aka Cincinnati mall let me know I’ve got some pics from the Gator Forest Partners days. 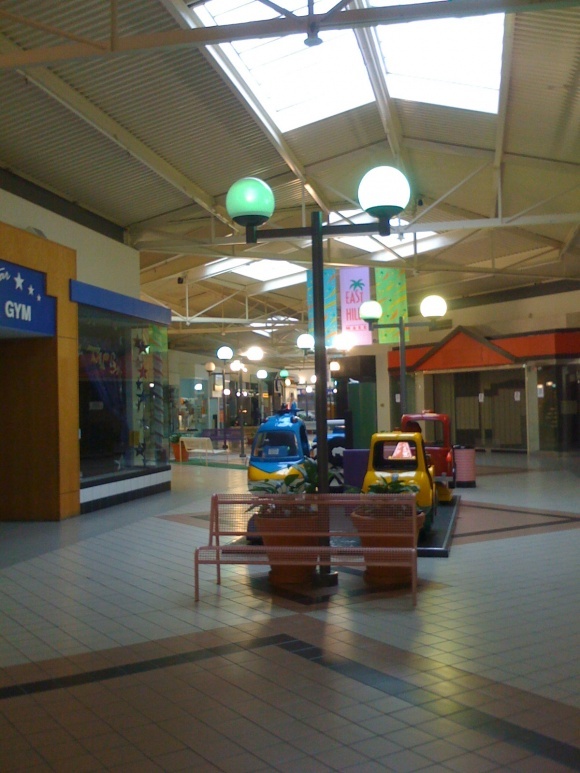 An OK looking mall with a sad history. 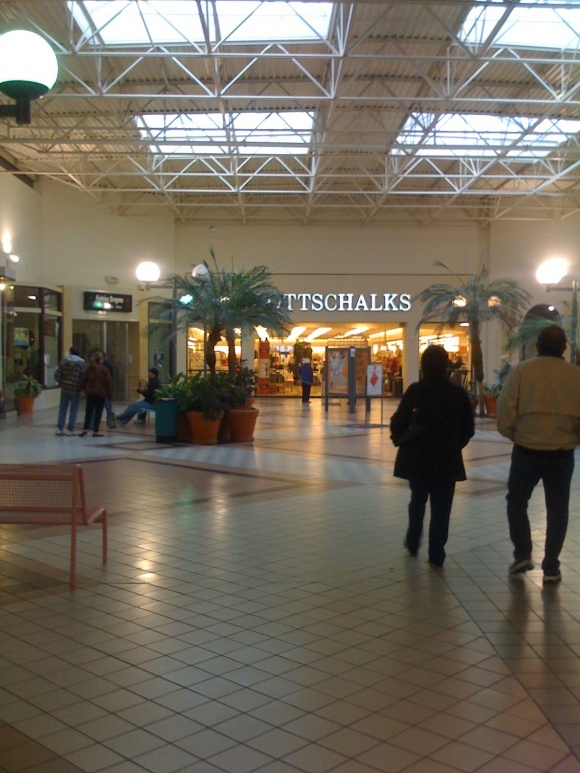 Gottschalks looks like it was built in the 1960s or early 1970s. The rest of the mall looks way newer, especially (what I assume is) the old Harris. That can’t possibly be more ’80s. 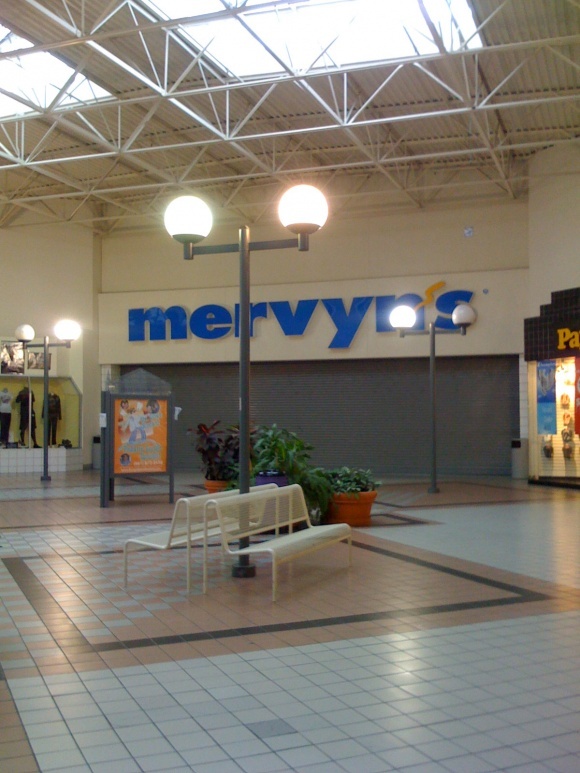 As for Mervyn’s, that looks to be an original store. 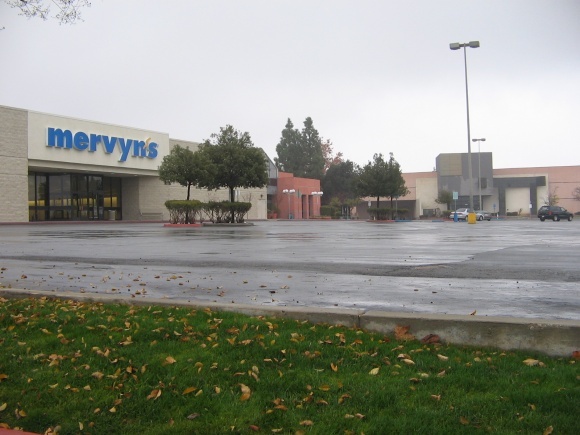 I’ve seen several Mervyn’s stores in pictures that looked like that. Poor choice of anchors indeed! 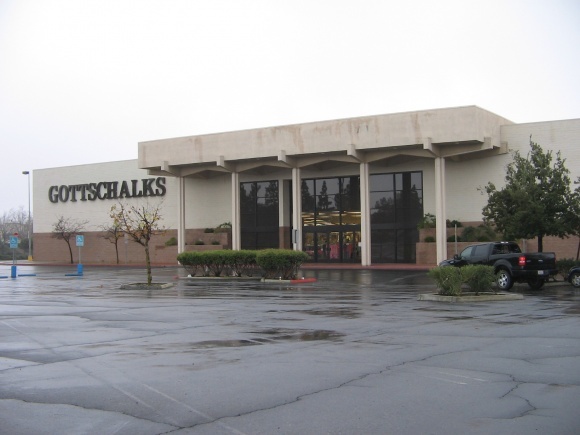 Gottschalks and Mervyn’s in the same mall with no real other rivals in the area? Wow! Hopefully they can re-tenant any of those stores with either Macy’s, Penney’s or at the very least a FOREVER XXI or something! I don’t think Macy’s or anyone else for that matter is interested. They already have a store at Valley Plaza, which is the dominant mall in town. Even that mall is having its challenges. 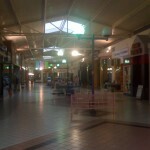 The former May Co (later Robinsons-May) store sits empty, hobbling an entire wing. 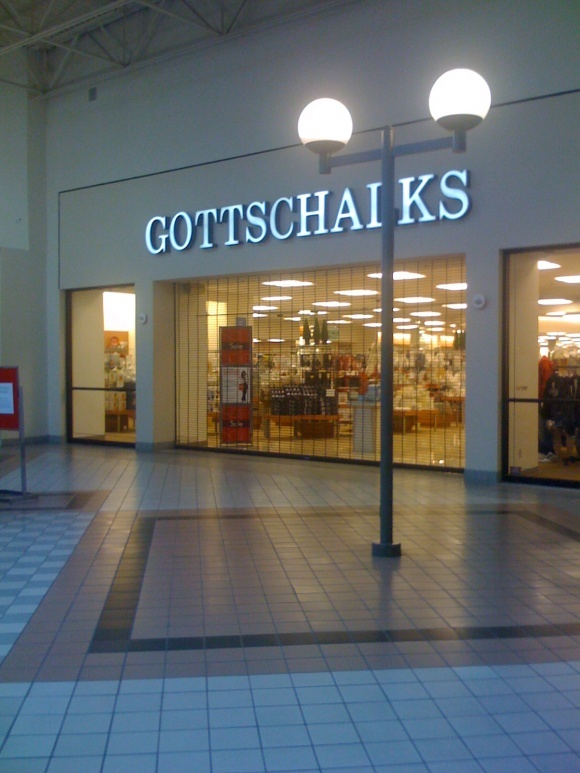 Gottschalks is now Forever 21. 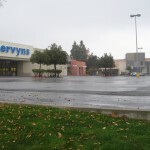 Penney’s and Sears are also in Valley Plaza, which is right off Highway 99, the major north-south artery connecting Valley cities. Given the current state of the economy, especially in the Central Valley, it’s hard to justify any of those stores opening a location in a dying mall, only 8 miles away from their current location. From what I can tell, it looks like the mall must have opened in the early 80’s with both GOTTSCHALKS and MERVYNS as anchors. Gottschalks used the same design into the 80’s. I am guessing the HARRIS store opened later, maybe the late 80’s. If you look at a Live Local birds eye view, the center mall entrance looks to be entact next to the store, meaning it was added on later. 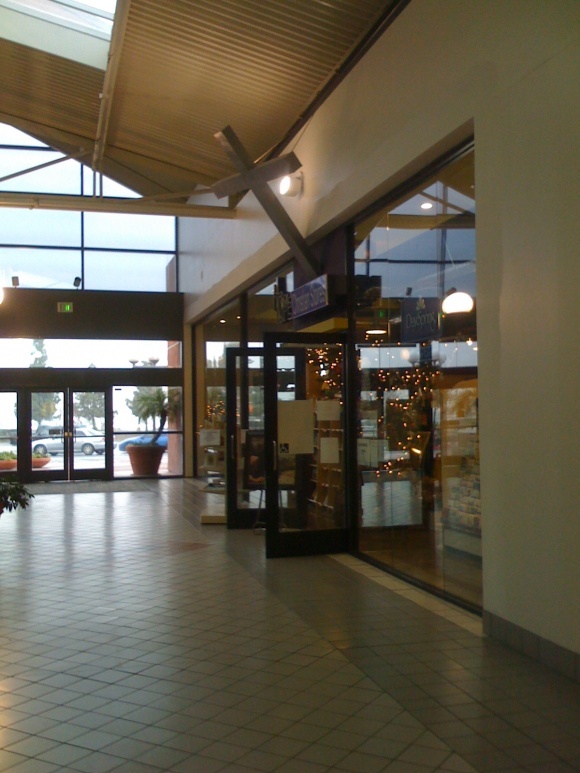 Harris opened a store similar to this design at the Moreno Valley Town Center in Moreno Valley. As for the theatre, im sure it could have been there for a while. Doing some research, HARRIS and the theatre opened in an expansion of the mall in 1990. 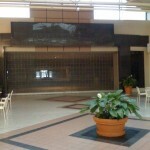 Here is some history about the East Hills Mall. I believe that the mall opened up in 1989?? It’s original anchors were Gottschalks, Harris, and Mervyn’. Sometime in the 90’s Gottschalks and Harris merged and became Harris-Gottschalks. 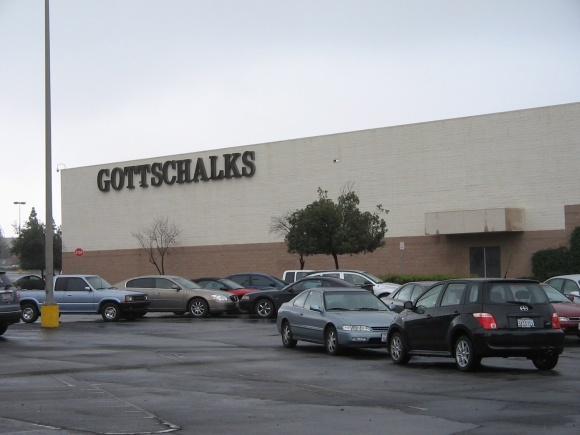 The original Gottschalks location became an outlet store around 2001? Some of the original store that I can remember were a Vans shoe store, Lerner New York (New York and Company), Sam Goody, a western store, Kid’s Mart, Rave, KB Toystore, Daniels?, Wet Seal, Casual Corner, a bookstore (can’t remember the name), Jane’s Hallmark, Millers outpost and another card store. 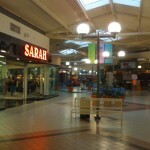 At one point the mall had a okay food court which had a Sabarro, Hot Dog on a Stick, and Arby’s?, Carl’s Jr. At some point in the 90’s the theater expanded and ate into the food court leaving Sabarro, A cookie stand, and Hot Dog on a Stick. The bookstore was Russo’s Books (main branch in the Marketplace). Earliest hits on Google News say it was being built in 1987, so 1989 sounds about right for the opening. Harris came in 1990. Those United Artists Theaters are really bad. They were state-of-the-art when they opened (1980’s — if this one opened in 1990 it was probably one of the last ones to be built) but now they are depressingly dated. No stadium seating, really small auditoria, cramped hallways, stuff like that. Eclipsed by the state of the art in movie theater design. I can recall ones in Pasadena and Woodland Hills that have already been demolished. Those were free-standing though, not in malls. Nobody misses them. At all. That mall never had a chance. I remember working at the Footlocker at the bigger mall (The Valley Plaza) in 1988 and having to pack up the crap, urrr – new and unsold stock that wouldn’t sell and sending it to the new store at the East Hills mall. Sadly, many of the other retailers, i.e. vans, nine west, etc, were doing the same. So when it opened, it crashed and burn fast. The UA theaters opened in 1990, and were state of the art for about 30 seconds, but the death walk had already started. Just a bad location, in that only about 30% of the population on the N/E side of Bako is even gainfully employed. And the rest, well – are not what you would call your wanted mall type customers. Hi! I’m from Bakersfield originally and lived near this mall when it originally opened. I can clear up a few questions here. 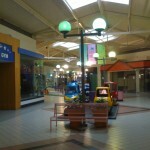 The mall opened in the fall of 1988. 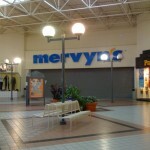 The two original anchor stores were Mervyns and Gottschalks. Both remained in place until their recent bankruptcies. No Target store was ever a part of the mall. Harris department store and the UA theaters were added around 1990 I believe. 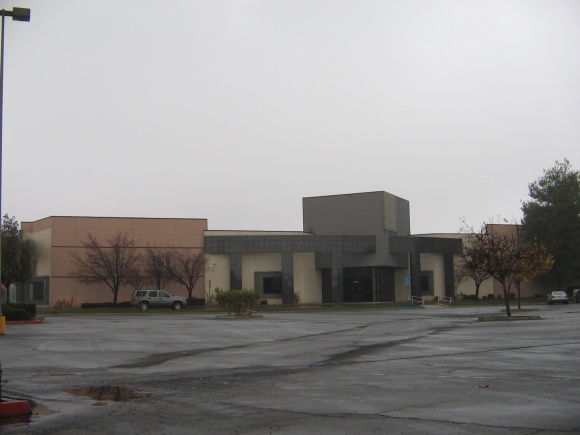 The theater complex was remodeled to its current state sometime prior to 1995. The surrounding businesses (Target, Walmart, etc.) were added between 1991-94. 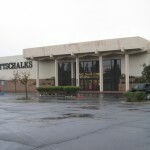 Harris was acquired by Gottschalks sometime in the early 2000’s and was closed about 6 months to a year before Gottschalks. EHM currently houses locally-based businesses. The last national chain to pull out was Anchor Blue, which was still operating under the “Miller’s Outpost” signage as of a few years ago. A few more thoughts: I was 13 when the mall opened. I remember it was a “hot spot” for the first 3-4 years. After that, it was a ghost town. 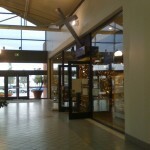 All the hot stores were located at the Valley Plaza Mall about 7-12 miles away. By the late 1990’s, the theaters had been the scene of a gang shooting. 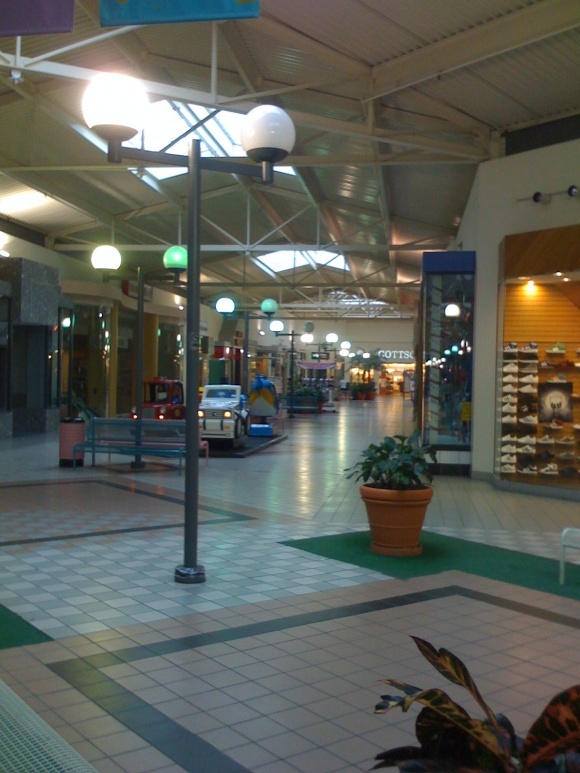 A few years later, the mall later became a place favored by seniors to walk for exercise, not shopping. I think the biggest handicap this mall faced was that the neighborhoods it serviced stopped expanding with the recession of 89-91. The well-to-do crowd moved en-masse to the other side of town and never returned. People with less income and less buying power have populated the Northeast/East side ever since. 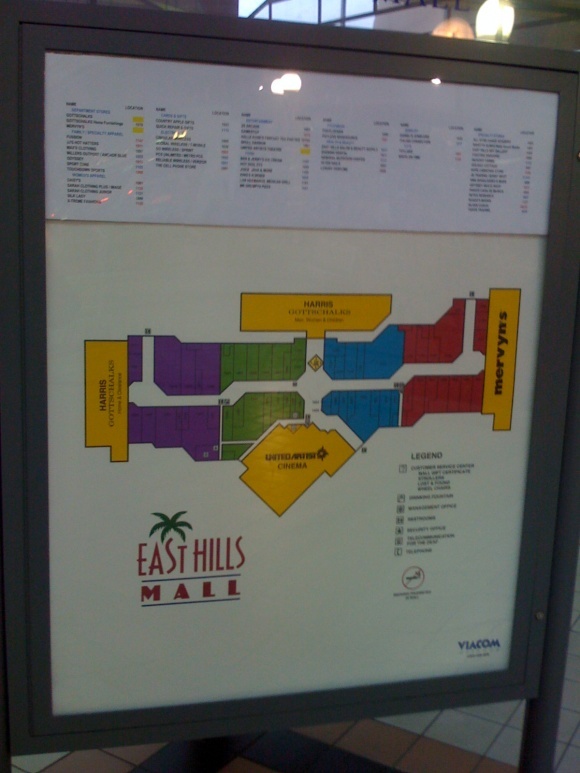 The East Hills Mall did open in spring 1989 . 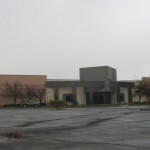 The movie theatre was scheduled to open with the rest of the mall but some sort of contract dispute kept it an empty shell until finally it opened in June 1989. The sevenplex was an instant sucess, darwing people from the other side of town due to the even cheaper dumpier complexes on that side of town. 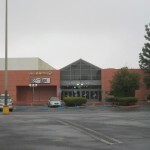 Problem for the mall is that audiences tended to avoid the mall before and after the movie, so in 1996 the entrance was moved inside the mall and two new theatres were carved out of the mall’s back entrance, and a third theatre was created in the old lobby, bringing up the total screen count to 10. It worked for a while, until Edwards built a stadium theatre in 1997. The theatre made the news in 1998 when gangs started shooting it up in one of the auditoriums and it spread to the lobby. Several people left the theatre on stretchers, although nobody was killed. I moved to Bakersfield in 1988. Everyone was raving about this soon to open shopping mall. It is my understanding that the gang shootout was actually at a larger 14 theater complex just blocks from the EH Mall not at the EH Mall itself. This 14 theater complex is now the Bakersfield Hispanic Church and has been for years. About the demographics of the area. Yes there are lower income neighborhoods in the vicinity but then again there are Country Club caliber homes within 2 miles of this mall with many well to do residents. We live in a 3000 sf plus home and have a 250k plus annual income as do most of our neighbors. 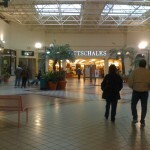 This mall is located along the 178 Highway. There are two exit choices that will take shoppers into the mall area. The over all traffic flow around this mall could have been better planned. An exit from 178 going directly to the mall instead of drivers having to work their way into the complex via side streets would have been a big plus IMHO. This mall has ample parking and pretty landscaping with nice shade trees. On the west side of Bakersfield are both a Bed Bath and Beyond and a Trader Joe’s which are always too crowded. Folks living on the East side dread going to shop there with their traffic and cramped parking and crowded stores. Either of those companies would do well in a Mall like the EH. Other business that would do well there would be Whole Foods or Ikea. There are many upscale neighborhoods east of this Mall on the 178. Also there is a Dell Webb neighborhood in the area. Close by is the Kern River along which are many homes on mini ranches that in the recent past were appraised at over $1 million. With the right combination of shopping choices and a great PR company this mall could overcome its past. BTW Anchor Blue left this mall earlier this year. The point about wealthy people being around is spot on. The population shifts were in some of the older middle class neighborhoods. The Bakersfield Country Club and Rio Bravo river and Country Club areas are still full of millionaires who live closer to East Hills Mall than anywhere. There’s also the somewhat sad stereotype towards people of Latino residents, who many assume can’t afford a mall. There are a good number of upper class and middle class Latino residents alongside everyone else. Unfortunately, that kind of stereotyping is very, very pervasive in Bakersfield and has been so since it was famous for being biased against the white Okies in the Grapes of Wrath era (heck, the book was banned in Kern County for many years for revealing it’s biases). I blame a lack of education: Bakersfield ranks the lowest in adults a bachelor’s degree of the 100 largest metros in the country. You don’t develop good views of people when you can barely read. I lived in the area when it was built…late 80’s. The Target was also new around the same time, I believe. The original 3 anchors were, in fact, Harris, Gottschalks, and Mervyns. 88-89 for opening is correct. There used to be a target in the same parking lot that also brought in a few more shoppers in the mid-90’s. It sits within walking distance from the East entrance. 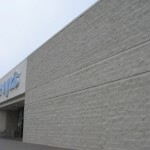 There was also some music store in the same parking lot that essentially killed off the music store within the mall. I don’t remember the name – bigger chain at the time. When they first opened this mall, it looked like disneyland. Huge colorful banners everywhere, nice landscaping inside and out. But it was doomed to fail. Also at the time, a majority of the new housing tracts were being built on the opposite side of town in the west and south west. It was a bit of a hastle to get to the east side to this mall. However, it’s also obvious the rent must be very low (as the article mentions) because there ARE still some tenants operating in the building. @Caldor, the theaters apparently reopened as a Regency Theater. 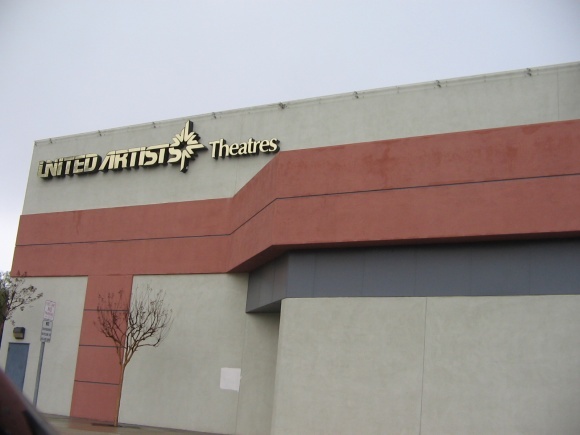 The old UA held as best as it could against the stadium seat theaters across town; before they opened it was the best cinema in Bakersfield (the old AMC and UA on the west side were lame in comparison). I remember when UA opened a second theater a block away to handle the load. Still a discount theater. Nice page on the mall, btw. I went to school across the street from it as it was being built and developed: It opened with two department stores on the East/West edges (Gottchalks and Mervyns), later the Harris’ was built on the South side (very soon after it opened). The best years for the mall were those original few years, then the slow, gradual fall began. First were the stores that had bad business models (like a buffet that lasted for all of a few months after the mall opened), then little stores here and there –it wasn’t all at once. The real pain started after a Wal-Mart opened right next door that, in tandem with a Target that is also next door, decimated a lot of the smaller shops like they do everywhere. 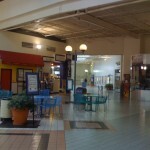 When they expanded the movie theater, the food court was mostly obliterated and only a few stores shifted to what was the mall’s center court. 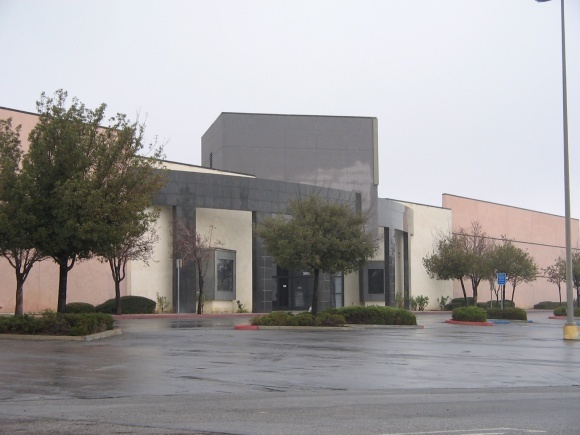 Bakersfield has never had much of an ability to support more than one mall. It barely supports the older, larger mall (Valley Plaza) which seems itself to by dying more and more every year I go back to see my family. Pay attention to Valley Plaza in the next 5 years as the new attached Target Store that was recently built takes hold. I foresee closures there as well. I am so glad I escaped Bakersfield. 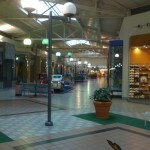 I visited this mall yesterday, December 26th,2011. There are only three real retail outlets there with a handfull of mom & pop / unusual stores. The interior lighting is turned off (the post globe lights) and there is no heat. 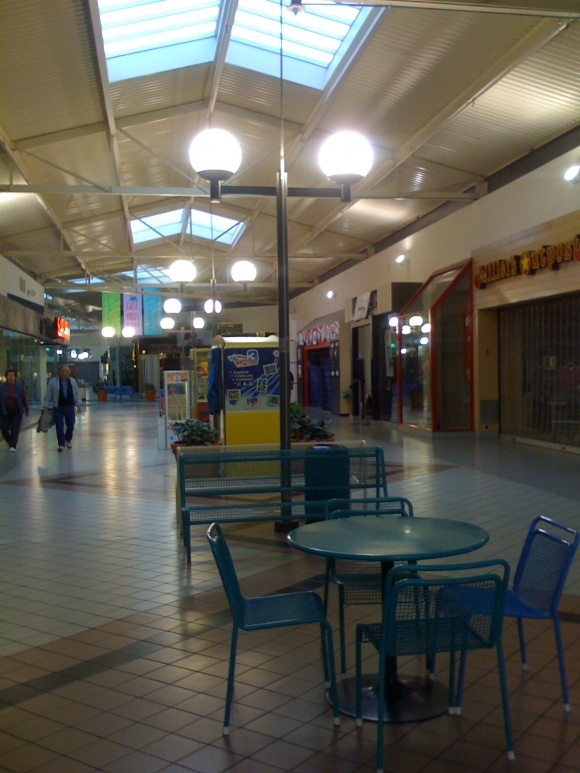 The mall apparently has come close to not being able to pay the electric bill according to my friend from Oildale. all the anchor store entrances and windows are boarded over with plywood and there are no visible signs of retail life anywhere except for the movie theater entrance. Found a out a year ago that Ben and Jerry’s opened a store there, or a franchise did. In any event, it’s Ben and Jerry’s. My girlfriend wanted to check it out, and I was hesitant because A) we lived on the northwest of Bakersfield and the drive would have been a drag and B) I used to live in East Bakersfield and the place is depressing. So we went and the Ben and Jerry’s did exist and it was stark how the demarcation line between the ice cream shop and the rest of the mall is. Everything is dismal, sad, pathetic, then you hit the Ben and Jerry’s, which doesn’t occupy a storefront so much as it’s carved out a large niche in the already tiny food court. After we got our ice cream we left ASAP. Earlier this year my girlfriend went there on her own, only to find out the place has severely reduced hours. I figure Ben and Jerry’s is there rent-free, but even so had to cut their hours back due to lack of customers. 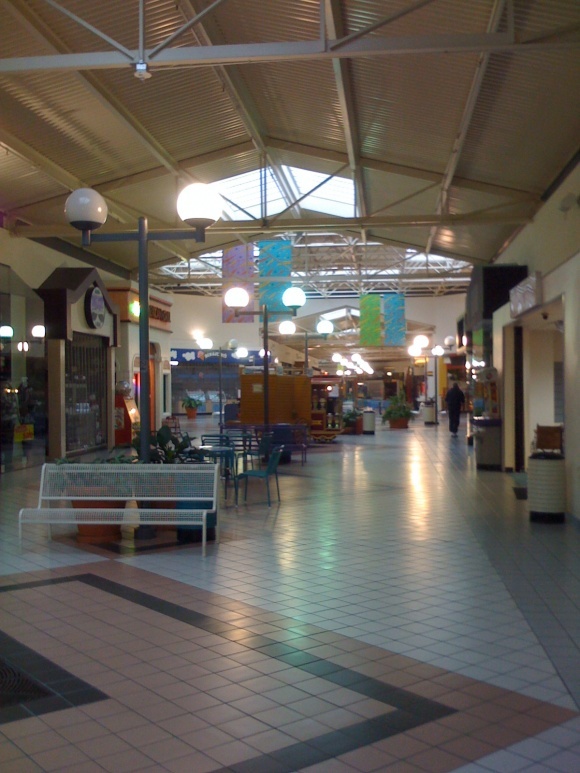 This reminds me a lot of a mall in Clovis, Sierra Vista Mall. Also was anchored by a Gottschalks on one end and a Mervyns at the other, with a Sears in the middle. Same poor choice of anchors. That mall is still alive though…barely. 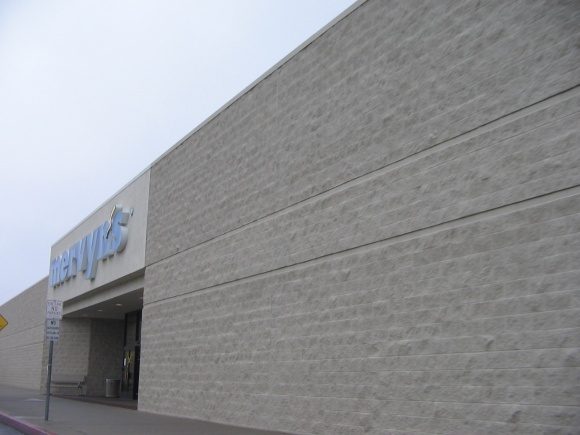 Mervyns is now Kohls, and Gottschalks is still empty. Theres a popular new (2007?) movie theater and an old abandoned movie theater in the back. I’d love to see a history of Bakersfield’s Golden State Mall, which is also mainly dead. Would like to see it make a come back. Because it’s closer to where I live. Need more stores like the other one has.